As you may have noticed by now I really do prefer a more tomboyish look. 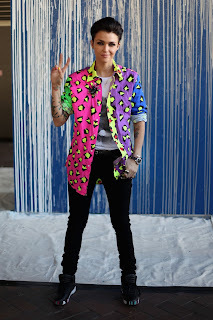 Ruby Rose is one of those who I have always been in awe of her style and overall look. The way she can have a masculine one day and feminine style another is how I have been feeling very frequently i never know what type of mood I will wake up in, but I will explain that more in another post. Here are just a few looks of Ruby's that I can't wait to try for my self. I love the hairstyle on this one, the shaved line really making the hair stand out. I also love the unbuttoned shirt and jeans look. As I have said in past posts I love the shirts and jeans combo but really want to loose weight and invest in some really good quality shirts and jeans for a change. The sunglasses just finish off the look for me as sunglasses are something I am obsessed with and I believe that sunglasses are a perfect accessory to any outfit. Another one of Ruby's looks I love is the tight pants, blazer and printed t-shirt. It is so easy to pull off but she does it so well. Again the sunglasses are the perfect accessory to the outfit. The outfit is also quite smart meaning it is perfect for many occasions. I love Ruby's casual outfits and this is one of my favourites. I love hi-top shoes they are honestly some of my favourite kinds of shoes. The shorts are nice and baggy perfect for warm weather especially like we are having in the uk. Then with the white top under an open sleeveless flannel shirt just adds to it. I think with the outfit and how she has her hair and sunglasses she just looks like she has a little bit of a rebel attitude, which I would love to be able to pull off. The final outfit is the black hi-tops, super skinny jeans printed top and a loud patterned shirt. Now this is one I really wish I could pull off however at the moment I don't really have the confidence for a loud print but I am hoping once the weight has dropped off and I reach the body goals, that this is something I could experiment with wearing. I would also probably need to invest in some new shoes for this and definitely invest in some good quality jeans. So there you have it. There is another one of my fashion inspirations. What do you think to Ruby's style?